As proud partner of the MiniRoos program, AIA Vitality is giving all Australian MiniRoos Clubs the chance to WIN a $10,000 cash grant to use wherever it's needed most. 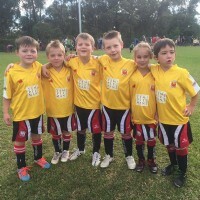 Springwood United Football Club has been entered and now we just need your help to be in the running to win! The top ten photos as voted by the public will be named as finalists, and one lucky club will be named the winner by our expert judging panel. Springwood United is currently holding 2nd position.